The CD-ROM is no longer for sale. Now available free to read online. Click here. Credit Card Payments may be processed directly from this page. Mail orders: Fill out forms and use "Print" command on your browser. More Information -Read a review of Archive I + II. Note: Archive II contains: hard to find portions of 2 books, 3 booklets, 1 article and 9 fliers. The three old books in Archive I alone cost us in excess of $100 to acquire. Countless hours went into the process of using an OCR (Optical Character Recognition) program to transfer text from the books and booklet to the CD-ROM. In the coming years, this information will increase in worth both financially and as an aid in the battle to preserve individual freedoms including the right to know the truth and make informed choices. VACCINATION ABSURDITIES AND CONTRADICTIONS by W.R. Hadwen, M.D., J.P.
Copyrighted 1929 and published by the Citizens Medical Reference Bureau, New York, this small book, 127 pages, "has been prepared especially for the busy man or woman to read." "The book points out the fallacy of community vaccination, involving compulsory measures, .." "The data contained herein is compiled entirely from board of health bulletins, medical journals and other authoritative publications." "PART I. THE VACCINATION REQUIREMENT IS STRENUOUSLY OPPOSED BY AN ENLIGHTENED PUBLIC SENTIMENT WITHIN AND WITHOUT THE MEDICAL PROFESSION: IT IS UN-AMERICAN AND IS SPONSORED BY CLASS INTERESTS WHICH WOULD PROFIT FINANCIALLY BY THE RETENTION OF THIS LEGISLATION." "PART II. THERE IS NO RELATION BETWEEN THE VACCINATION REQUIREMENT AND THE PRESENCE OR ABSENCE OF SMALLPOX." "PART III. THE VACCINATION REQUIREMENT, INVOLVING AS IT DOES, WHOLESALE INOCULATION OF THE POPULATION OR AN IMPORTANT PART THEREOF, CONSTITUTES A MORE SERIOUS MENACE TO PUBLIC HEALTH THAN SMALLPOX." COMPULSORY VACCINATION A MENACE TO PERSONAL LIBERTY by J. M. Peebles, M.D. This 325-page book is a gold mine of information and a wonderful source of quotes. It is copyrighted 1900. If your doctor says that vaccination is safe, effective or necessary, here you will find an abundance of qualified second opinions. "Now the percentage of fatality, not only in small-pox but in all zymotic diseases, is steadily declining, as sanitation becomes more rigidly enforced in crowded districts, in spite of vaccination and other silly and reactionary devices which the doctors from time to time, aided by legislation, continue to inflict on mankind." ~Alfred Milnes, M. D., M. A. A. M. Ross, M. D., in his vigorous pamphlet, "Vaccination a Medical Delusion," writes: "Wherever the streets are narrow, the lanes and courts filthy; where cesspits abound and filth is allowed to accumulate and ferment; where the weak, intemperate and unclean congregate together, and where the children are ill-fed and badly clothed—there small-pox makes its home and riots in filth and death." "I can sympathize with, and even applaud, a father who, with the presumed dread in his mind, is willing to submit to judicial penalties rather than expose his child to the risk of an infection so ghastly as vaccination." ~Sir Thomas Watson, M. D.
"Vaccinationists say that when vaccination does not 'take' the operation must be repeated, because no result means no protection given. Now, we see that soldiers not protected because vaccination did not 'take' were less attacked by small-pox than those duly protected by the good result of their revaccination ; and that the death rate in those vaccinated with good result was greater than among those in whom vaccination did not ‘take’." ~Charles Ruata, M. D., Professor of Hygiene and of Materia Medica in the University of Perugia, Italy. The 18th Chapter is made available here because it documents the total failure of vaccination to achieve an improvement in public health. Later editions of this book have a 'modified' chapter 18 and thus if you search the used book market for a copy, be sure to get the First Edition! Our copy was published 1898. 123 pages have been excerpted from the book, The Wonderful Century. If you wish to debunk the current propaganda about 'cowpus' being a preventative of smallpox, this is excellent source material. This 32-page booklet contains 28 separate opinions, each printed on a half-size page. All opinions are adverse to COMPULSORY enforcement of vaccination and many are adverse to any vaccination. If you want to quote an able thinker who lived in the period of common smallpox epidemics, here is a delightful assortment of authoratative opinions. "M. Pasteur claims to have treated upwards of 5,381 persons [for rabies], the great majority of whom have suffered no ill effects, either from the bites they had sustained, or otherwise. Most of these, however, there can be very little doubt, were never liable to contract hydrophobia at all. The one fact on which the public can absolutely rely is that 152 persons have, since their inoculation, died from hydrophobia. 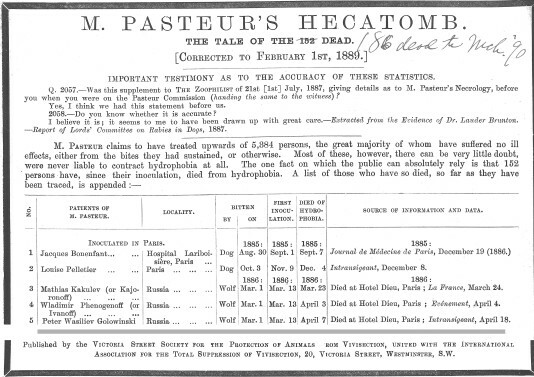 A list of those who have so died, so far as they have been traced, is appended:-- "
The above paragraph is the main text of the document other than the 152 names of M. Pasteur's patients who died, where vaccinated, bitten by what animal and date, date of first inoculation, date of death and source of information. *Hecatomb: A mass ritual slaughter originally consisting of 100 oxen or cattle. The first page of this PDF file is a clean version. The 5th page is a repeat of page 1, with the written note at the top stating that 186 had died by March '90. A magazine called The Nineteenth Century, printed in May of 1882 a 20 page article rebuting the the practice of vaccination. 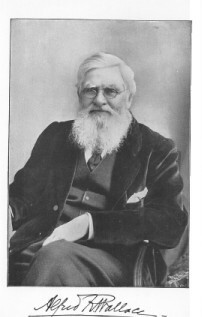 Quote, " Be this as it may, Dr. Carpenter's attack, made as it is by one who is universally recognised as the leading representative of vaccination, affords that oppor- tunity for free and open discussion the lack of which has been, in my opinion, the only cause of the continued national faith in what I believe to be an exploded fallacy and a baseless superstition." The Practice of Autopathy, pages 100-157, by E. R. Moras, M.D. contains a long forgotten "Volunteer Letter to President Wilson" which formed a part of the book The Practice of Autopathy, The Law of Health and Disease. This release is timely in that it will be for sale at the beginning of this years Flu season and at the early ramping of the 'Avian Bird Flu' scare. The information in this letter contains records of the earliest Flu Vaccine fraud and failure and of course the author's failure to intrest the U.S. government or the AMA in sound advice about how to prevent hundreds of thousands of dead in the USA alone in the 1918 Flu Pandemic. Autopathy, so named by E.R. Moras would be called 'Alternative Medicine' today. Common sense diet and detoxification formed the basic of Moras's teachings. Included are 58 pages plus the Preface and title page. It is half a century since these fliers were written by Duon Miller for Polio Prevention, Inc., in Coral Gables, Florida. One mind catching flier is "Whiskey or.. Polio" decrying the health distroying addictive 'Cola' drinks. 'Polio "Gambling"', "Sugar + Sugar = Polio", "The Polio Racket", and a letter to President Dwight Eisenhower pleading for a scientific and honest approach to the Polio problem, a battle for truth which fifty years ago was won by the vaccine racket. But the war is not over and you can help win for truth by helping put these CD's in hands attached to receptive minds. These files are PDF image files with the recognized text 'Under' so that you can copy and paste text. Some images do not contain recognized text so that 'copy and paste' will not be possible. Examples: 'Whiskey Glass page' and some of the diagonal box text in murder.pdf. OR a web browser. Preferably both. This CD-ROM contains files in a universal file format that can be read by Microsoft, Macintosh and Linux operating systems. Insert this CD-ROM in the CD drive. If you do not have a web browser, then do the above and 'point' your PDF reader to the CD-ROM. The PDF files of interest will be in the directories: archive1\hadwen, archive1\facts, and archive1\peebles. If a PDF picture appears 'blocky', Zoom is set too high. Reset your viewer to 100%. There are PDF (Adobe Acrobat Reader), HTML (web browser) and word processor (.DOC, one .RTF and some .SXW) files on this CD-ROM. Each book or booklet listed above is available in the PDF (Adobe) format. See the list at the top of the page for the file formats available for each title. It should be noted that most modern word processors will also open the HTML files. Your web browser will likely be able to save any HTML file in a plain text format for your use in a word processor. The PDF files can be searched. If two PDF files are listed, one will be small in size and clean in appearance, but which may contain an occasional error. In any case, where you suspect an error in either an HTML or small PDF file you can consult the larger sized PDF file which is an image containing file. The image of each page will be a faithful duplicate of the original. Where two HTML files are present, one will be a simpler format displayable by all web browsers.